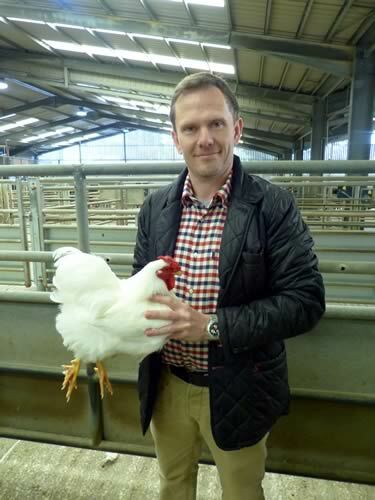 Mr Pownall, from Glossop, Derbyshire, was crowned champion at Skipton Auction Mart for his pair of White Wyandotte bantams. No stranger to success in Skipton, Mr Pownall won the Craven Feather Auctions summer show last year with another pair of White Wyandotte bantams. This year’s winning pair were sold for £60. “They’re a nice, quality show pair,” said Mr Pownall. So what’s the secret behind so much success? “Hard work and dedication,” he said. David Brewer, who keeps poultry with his father Peter in Cononley, was named reserve poultry champion with his trio of Black Silkies, a cockerel and two pullets, hatched this spring. The Brewers have previously won both national and federation championships with their Black Silkies. This pair sold for £60. There were 175 lots put forward in the show, which featured a new format this year, with entries sold in the main ring. For the first time the show was stewarded by Craven Poultry Keepers Club and featured several new ‘Blue Ribbon’ card-graded classes judged on quality. Expert feedback was given by experienced poultry keepers overseen by Edward Boothman, of Silsden, chairman of both the Craven club and The Poultry Club of Great Britain. M Moreton came second in the Large Fowl category with a trio of Houdans, sold for £25, and also came second in the Bantams category, with a pair of silver Kraienkoppe bantams, sold for £45. Derek Shuttleworth of Glusburn picked up third in Large Fowl with Vorwerk pullets, which went for £30. In the Water Fowl category, Edward Boothman himself emerged triumphant with a pair of white Calls, sold for £40, while Mrs M Leggate, of Strathaven, South Lanarkshire, picked up second and third prize with a pair of silver Appleyard ducks and a pair of Cayuga ducks. Top price in sale was a trio of Rhode Island Red pullets, from J T Hardacre of York, sold for £65. The next poultry sale ‘in the pens’ is on Saturday November 8, with the high profile Christmas show and sale due to take place on Saturday, December 13.